I look for places made of poetry for me, places alive with history, wildlife and mystery. Then I move in if I can. Writing...is an art, a craft, a making. 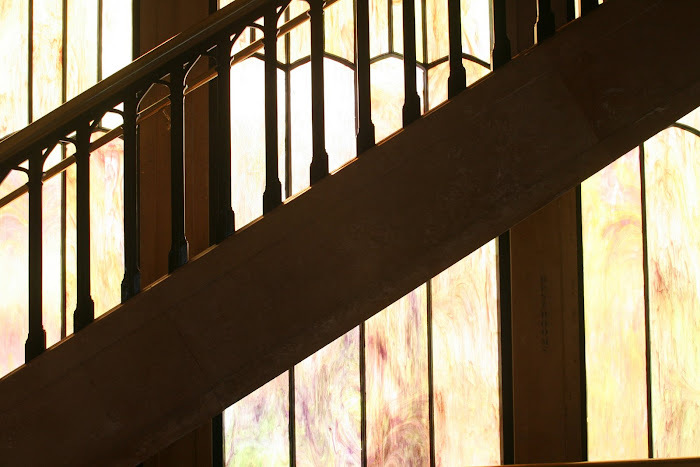 To make something well is to give yourself to it, to seek wholeness, to follow spirit. To learn to make something well can take your whole life. It's worth it. If you keep your fingers flying fast enough, your inner critic won't have a chance to cluck its tongue. If you would not be forgotten as soon as you are dead and rotten, either write things worthy reading, or do things worth the writing. - Kim Addonizio, "What Do Women Want?" Writing is about hypnotizing yourself into believing in yourself, getting some work done, then unhypnotizing yourself and going over the material coldly. In poetry, the only rules worth thinking about are the standards of perfection you set for yourself. It was, not surprisingly, extremely busy, crammed with families intent upon enjoying Memorial Day in this gorgeous green setting. 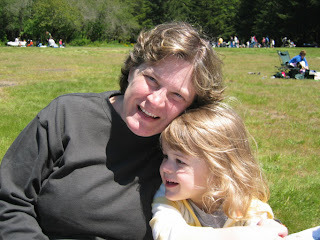 We had a picnic lunch and tried to keep warm when the wind blew the clouds over the sun. And then we went hiking. 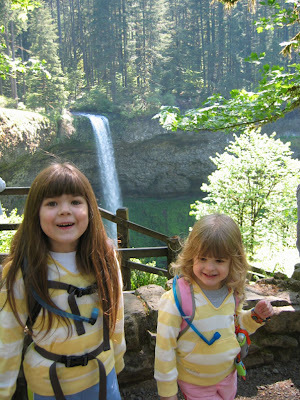 Emma and Kate were thrilled with their new hydration packs and got a huge kick out of sipping as they walked. 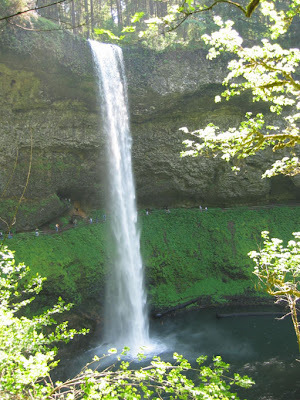 We didn't go far - just down to South Falls where we could stand behind the pouring water and enjoy the cool mist, and down along the river a short way through the trees and ferns. The girls gathered moss, which they decided was hair from Mr. Grinch, and had a generally fabulous time. Hopefully we can go back when it's not so crowded and hike a few of the less traveled trails. But for now, our summer of hiking and outdoors activities is off to a great start! It's here! 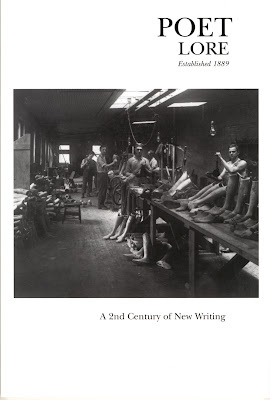 The Spring/Summer 2007 issue of Poet Lore, which includes my poem The China Has Not Been Washed, as well as wonderful work by Theresa Boyar (The House at Coast Meridian, 30 Years Later) and Nathan McClain (No, I don't love you). If you get a chance, I hope you'll check it out! So, here's the rest of the story about Saturday. Last year I ended up at the beach for hours and hours with the girls. It got ugly fast when Kate decided she was terrified of the waves and the dozens of tiny dead crabs littering the beach. It was hot, we had no idea when Dennis would get there, and we were all pretty cranky by the time he did. This year, my parents came over from Idaho for the weekend. We planned to leave at a leisurely pace sometime after Emma's swimming lesson Saturday morning. It was a little too leisurely. 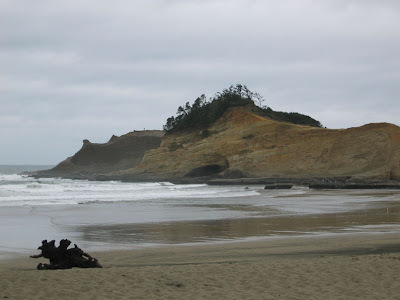 We got to Pacific City a scant 10 minutes before Dennis. The place was nuts with cyclists and their friends picking them up, so we had to park at the far side of town and take a shuttle bus to the finish line. As we approached it we were driving parallel to all the cyclists coming in, and who should we happen to see but Dennis! We waved and held up our signs through the bus window, then he pulled over and waited till we got off and were ready to snap some photos of the finish. We had planned to walk on the beach before Dennis arrived, but obviously we need to work on our timing. We came back on Sunday and had a blast anyway. 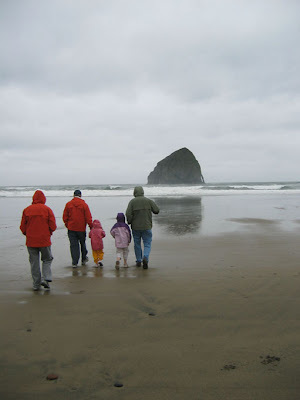 Kate was coaxed out onto the sand by Grandaddy and by the allure of the perfect sand dollar (Emma found one almost immediately). Before long she was collecting shells and running circles around all of us. 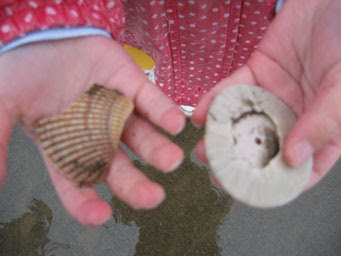 She even reached the point where she picked up a crab shell and held onto it like it was treasure. When we suggested it was time to leave and head home, her response was "No! Never ever!" We'll be going back again soon. He did it! 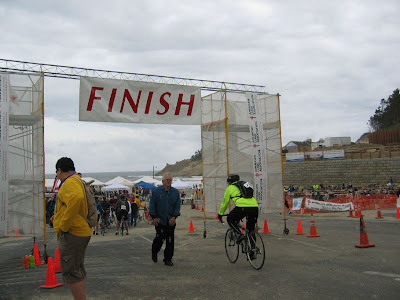 Dennis made the 100 mile ride in 8 hours (just under 7 hours of actual riding time), which is 2 hours less than last year. Thanks to everyone who sent support and good wishes. 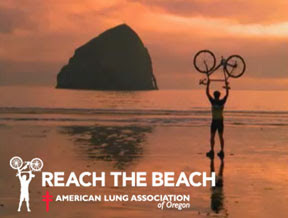 A couple of weeks ago I told you about Reach the Beach and how my husband is getting ready to ride his bicycle 100 miles from Portland to the Pacific Ocean to raise money for the American Lung Association of Oregon. Well, it happens this coming Saturday, May 19, and it's not too late for you to join the fun. Dennis is just $155 short of his $500 goal for this year, and that's where you come in. Any reader of this blog who makes a donation to help Dennis support this worthy cause by midnight on Friday, May 18, will be entered in a drawing to receive a thank-you gift from me. What can you win? If you're a writer, I'll send you a current issue of any lit mag carried at Powell's (and they have quite a few). If you're a knitter, I'll send you something yummy (based upon your preferences) to knit with. Or, if you like to live dangerously, I'll send you a small handknit surprise! Oh, and if you've already donated, you still qualify for the drawing. There will likely be more than one winner, and if the number of folks involved isn't too huge, there may be something for everyone. Keep your fingers crossed for good weather, smooth riding, and easy breathing! I'm happy to announce that my poems "One Red Door" and "From the Other Side of the Future" were both winners in The Hiss Quarterly ekphrastic poem contest. Go check out the new issue and read all the great stories and poems. And last but not least, I'm on the shortlist for the Lichen "Tracking a Serial Poet" competition. The winner and runners-up will be published in the forthcoming issue. Wish me luck! 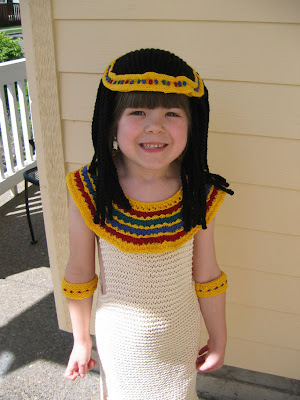 Egyptian princess dress-up from New Knits on the Block. 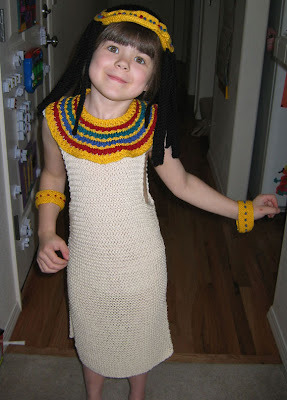 I knit this as a surprise for Emma's birthday (she's been asking for it for months) and she loves it. Overall it was a fun, fast, and fairly easy knit, though the wig was pretty labor intensive. Definitely well worth it, and now Kate wants one too.